Salads Don’t Have to Be Boring—This One Tastes Great and Is Great for You! This refreshing recipe features a host of sunny ingredients that always delight our taste buds, including pomegranate seeds, lemon, and mint, a powerful flavor combination that delivers a tantalizing combination of sweetness and tartness in every bite! This flavorful salad is low on calories without sacrificing taste, making it a great choice for a healthy and satisfying lunch, or light summer dinner. Not only is quinoa naturally gluten-free, it’s also a superfood with plenty of protein and fiber to fill us up. To top it off, this salad keeps really well and tastes even better the next day, making it perfect for munching on all week long! Rinse quinoa under running water in a large strainer, then transfer to a medium-sized pot and add 2 cups of water. Bring to a boil over medium-high heat, then reduce heat, cover, and simmer for 15 minutes. Remove from heat and let sit 5-10 minutes, then fluff with fork. While quinoa cooks, toast almonds in a small pan over medium heat until golden brown, and set aside. 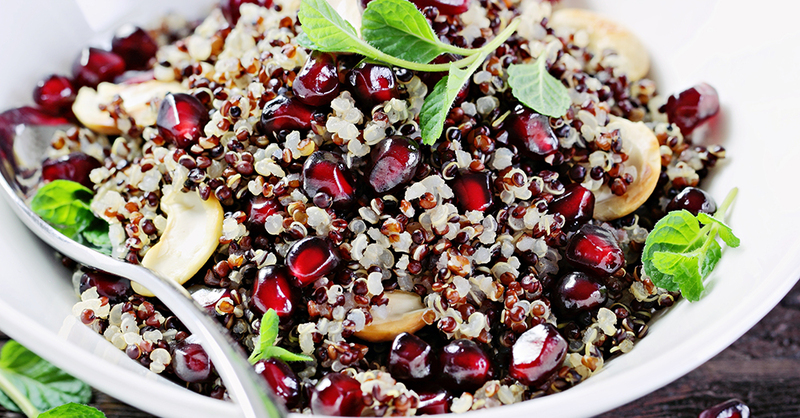 In a large bowl, combine quinoa with mint, parsley, cranberries, black olives, almonds, and pomegranate seeds. In a small bowl, combine olive oil, lemon juice, sea salt, cinnamon and pepper. Pour liquid over quinoa mixture and toss thoroughly. Drizzle salad with additional olive oil and lemon juice, and sprinkle with goat cheese and fresh mint, if desired.